View More In Socks & Hosiery. Aura Borealis Legwear offers only the most premium Women's products. Our footed tights are the best way to accessorize your apparel without the pitfalls of sagging, pinching, baggy ankles, or bleeding in the wash like other brands. Our soft and luxurious microfiber tights consist of the highest quality cotton, nylon, and spandex, that allows for maximum comfort and breathability, while constructed to provide the right amount of stretch for a perfect fit every time. With a variation of color and size options, you'll always be stocked to have the perfect look for any occasion. The elastic waistband is specifically made for a comfortable fit that won't dig into your body, and will stay up throughout the day. At Aura Borealis, we proudly curate exceptional products in the USA, and stand behind them 100%. If you are not completely satisfied, PLEASE feel free to contact us with your concerns. Warm footed tights with breathable texture allows for perfect comfort all day long. Assorted color that will compliment all your outfits. 60 Denier Solid Opaque Color can support multiple uses. 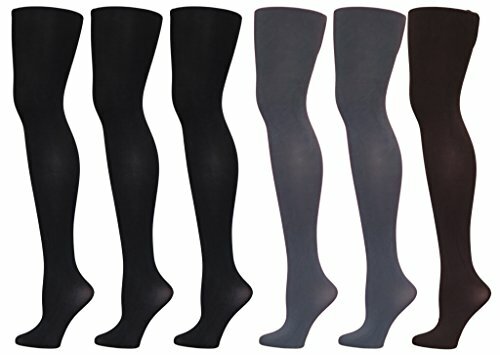 Great for everyday wear, dancing, iceskating etc. Microfiber Nylon for soft, comfortable, silky and durable feel. Comfort waistband Will Not cut into your waist, and won't Ride Down, or Sag. Proudly made in the USA. Contents: 79% Nylon, 18% Spandex, 3% cotton. Wash Carefully and separately. Line Dry. Do not iron. Do not Bleach. If you have any questions about this product by Aura Borealis, contact us by completing and submitting the form below. If you are looking for a specif part number, please include it with your message.